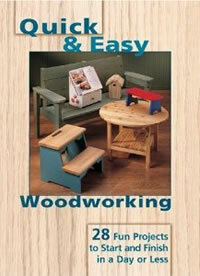 Quick & Easy Woodworking: 28 Fun Projects to Start and Finish in a Day or Less is a nice set of projects that are useful and realistic. The book is intended for new woodworkers, but it also lends itself well to projects that woodworkers of any skill level could do with their kids. What I like is that the projects are not only skill appropriate, they are real and usable. Kids can often pick up on if they are doing a project that made up just for pretend, or dumbed down for kids. These are functional and will be a big source of family pride because the results can be used ever day.